Fully parameterized Reed Solomon Decoder. Adaptive code rate can be varied on the fly. Parameterized bits per symbol, codeword length and parity bytes. Parameterized generator and primitive polynomial. Burst or streaming decoding support. Various architectures for different gate count/speed combinations. Fully synchronous design using a single clock. Synthesizable VHDL or Verilog code. 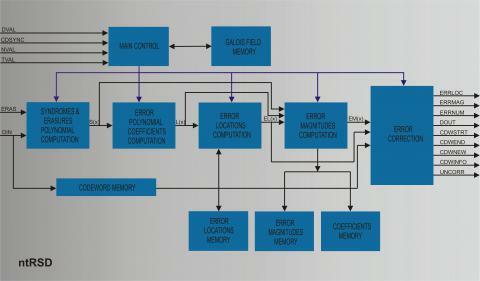 C++ model for system simulation.